Friday did not begin for me with the chatter of folk or the revving of engines. It began at 2 'clock in the morning as I arose to hunt the monster of Loch Ness by night and then by dawn. The reasoning is clear enough and has been repeated by other monster hunters throughout the decades. The theory is that this creature of the cold, dark deep will be more inclined to break surface if it is also cold and dark. Likewise, researchers speculate that the creature is more likely to put in an appearance around daybreak as that dark recedes and the noise of humans is yet to jar upon the senses of the creature. That does not make an appearance a foregone conclusion, but hopefully tilts the odds in one's favour. With that in mind, I set up the night vision binoculars on their tripod facing out into the dark gloom of the loch from the shingle of Foyers beach. The composite video feed from the binoculars is fed via usb into a video capture software package which can then record anything of interest to hard disk. The coverage afforded by this technique would be about 18 square miles to the horizon, though not all of that area is simultaneously covered and objects become less detailed as the horizon is reached. As it happened, I was entertained by two ducks which showed up well on the software, but no monster hoved into view. The picture below shows them, but nothing was visible to the naked eye. Even though the official sunrise time was given as about 0420, the light levels began to perceptibly rise about 0345 and I decided to do my now traditional dashcam drive up "Monster Alley". To recap for new readers, the Loch Ness Monster has been reported on land since Victorian times. Why it should do that is a matter of debate, but the majority of these reports come from the stretch of shore between Foyers and Dores. Some of these have occurred on the road running past the shore and combining this with the previous arguments about darkness and dawn, I hit the road with my dashcam trained on the road and headlights at full beam. Capturing a lumbering thirty foot monster on dashcam is not the sole aim of this experiment. I also want to see what else happens on these roads in order to understand the full range of phenomena. Now that includes deer and I finally managed to get some decent video of deer crossing the road in front of me. Unfortunately, uploading video on a campsite wifi is not the fastest facility, so I defer to a screen grab and leave the videos for another day. In fact, I saw six deer during that one hour run, a lot more than I usually do. One was a bambi, perhaps weeks old, which just stood on the road looking at me and wondering what to do next. I trundled to a halt in a Mexican stand-off kind of way as this little critter defied me to pass. I began to inch towards it and it decided discretion was the better part of valour and bolted across the road. It's mother watched me from the bushes, but decided not to follow at that point! Evidently, dawn is a good time to spot deer. My reason for these dashcam recordings pertains to the explanation that deer are mistaken for monsters in such instances. I doubt this and will expand on it more in a later article. Towards 5am, I decided it was light enough to resort to my usual camera and I returned to base and to the mouth of the river Foyers (opposite the island where Tim Dinsdale used to maintain a lonely retreat). From here I maintained a watch until 6am and decided to call it a day. Keeping a focused watch on the loch with little sleep is no fun. The rest of the day was more of a go-slow due to my rather tired state of mind. A visit was made to Fort Augustus, another to Invermoriston where I took some pictures in regard to a future article on the Hugh Cockrell photograph of 1958. Finally, I paid my respects at the grave of dear old Alex Campbell, laid to rest in 1983 near Fort Augustus amidst the clamouring voices of those who doubted his integrity. This man's report of the Mackay sighting in May 1933 to the Inverness Courier began a phenomenon which has not stopped to this day, and I for one salute him and defend his honest part in this drama. And so, farewell. Tomorrow I head back to Edinburgh and will further process what has been learnt, including a large amount of trap camera pictures! I awoke to a dull kind of day this morning, stirred by the sound of caravan doors shutting, cars moving on and people on the go. Having been refreshed by coffee and Alpen, the weather began to improve until by mid afternoon, the sun was shining strongly and the occasional breeze gave some relief. It was a good day for Nessie hunting. The first activity of the day was to take a walk around the shoreline of Foyers. That took us to the old Aluminium works which once employed about 500 people in the village and turned into a vibrant centre of community and commerce for several generations. That has all gone now, apart from some brick buildings and a rather disused playing field with rickety goalposts which must have once staged many an event under the Loch Ness sunshine. Walking along from there takes one to the Tail Leat which is a river that feeds in the loch. It was here that Ted Holiday watched a dome like object through binoculars from somewhere near Foyers village in 1962. The object submerged vertically leaving a large concentric wave spreading out from where it once occupied. The photo below shows that area from the river looking out to the loch. After that, it was but a short walk to the place where I visited Frank Searle's caravan exhibition in 1983. It is, of course, gone now, and I was not sure which of two sites it once occupied. Anyway, the photos below shows my favoured site and there is even groove marks there, which I doubt belonged to Searle's caravan; but it was interesting to muse on that theory. Loch Ness lore suggests that when Searle left in 1984, some local lads decided to tip his caravan into the loch. That seemed an eminently feasible project as there was a nice sloping slip path right beside the caravan site leading right down to a mini pier for a caravan to take a flying take off into those deep, peaty waters. The photos below show that "runway" as well as the murky waters which presumably hold the remains of a caravan out of sight. They have used sonar to detect planes and monster props, but one thinks that no one is in a hurry to refind this particular aspect of Nessie archaeology! After this, it was off to find the camera I had left on watch by the loch since early April. Having found it safe and sound, unstolen by tourists and ungnawed by Nessies, I plan to check its SD memory card later tonight. Whether I will leave it over June, July and August is debatable as the volume of people walking and canoeing past the spot will increase multiple times, and, yes, I do not trust them all to leave them alone! After a combined lunch and monster watch, it was off to Dores to see if Steve Feltham was at home. He was not, and so that particular trip was reduced to a walk along Dores beach; which has its fair share of flies (not midges I would add). After that, I took a whim to revisit the site of the famous Lachlan Stuart photograph. A thought had seized my mind as we drove in which the sceptics' star witness, Richard Frere, had claimed that Stuart had shown him the alleged hay bales behind some bushes at the site. I have already raised doubts about Frere's testimony in other articles, but I always thought this idea of the hay bales being hid behind bushes was questionable. The problem being that I don't think the foliage along this shore is thick enough to hide three or four bales of hay. A sample picture is shown below. I walked for several hundred metres either side of where I took the path down to the loch. During that time I tried to imagine three bales of hays being hid from sight. Others may have an opinion, but for me, the bushes were too thin for the task and there is not much breadth of bush since there is a high gradient of grassland rising promptly from the pebble beach. And I say this, knowing that journalists from the Express came to investigate the site, as did Constance Whyte and Maurice Burton. No indication of any such objects are mentioned in their writings. For me, this is an indication Frere was wrong. Anyway, a night investigation will ensue later tonight. I hope I can stay awake. For a change, I will type my visit to Loch Ness from the shore itself, rather than write it up after I have returned. Well, actually, I am not quite sitting on the pebbled shore watching the wave lap up at my feet. I am rather at the campsite looking out their window onto the loch. The camera sits at my side, ready to be called into action, as occasional glances intersperse this communication to you. The loch is calm, the sun is setting on what has been a good day. All it needs is a large, black hump to break the surface as well as the calm of this situation. The journey was easy enough from Edinburgh as I drove past Highland splendour on the way up the main road to Inverness and then onto the back roads that lead to the small village of Foyers on the south side of the loch. Turning into the Loch Ness Shores camp site has now become a familiar routine as I greeted the Forbes who run the site. The site looked busy for school term and indeed it transpired that business is on the up. I can see why looking around, I just wonder how much the Loch Ness Monster has to do with people's holiday decisions? As you can see below, a new thing greeted my eyes as I walked around. Perhaps those holiday decisions are more Nessie oriented that I thought. Having erected the tent and disgorged the contents of the car into the tent, I went for my first look at the loch. Strolling along Foyers beach towards where Hugh Gray took his famous photograph in 1933 was a pleasant stroll. The sun was beginning to dip and causing glare to reflect off the loch surface. Averting my gaze, I noted two canoes making their way up the loch, as you can see in my photograph below. As usual, the camera failed to capture the experience of the human eye and lacked the detail I was taking in with my own two eyes. I would guess they were about 100 metres away and their entire boat length would be commensurate with the large back of a monster. One wonders how convincing even such a photo would be to the disbelieving world. It was a good place to reflect upon, for after all, Dinsdale filmed a hump across the very narrow stretch of water I now surveyed. I considered the fact that Tim Dinsdale had only claimed two or three sightings of the monster in nearly 28 years of expeditions and loch surveys. I then thought of Ted Holiday, who claimed four sightings in the space of about 18 years. Not very good returns on investments, you may suggest. I would agree. The Loch Ness Monster is a beast that rarely surfaces, let alone present itself obligingly to the camera. 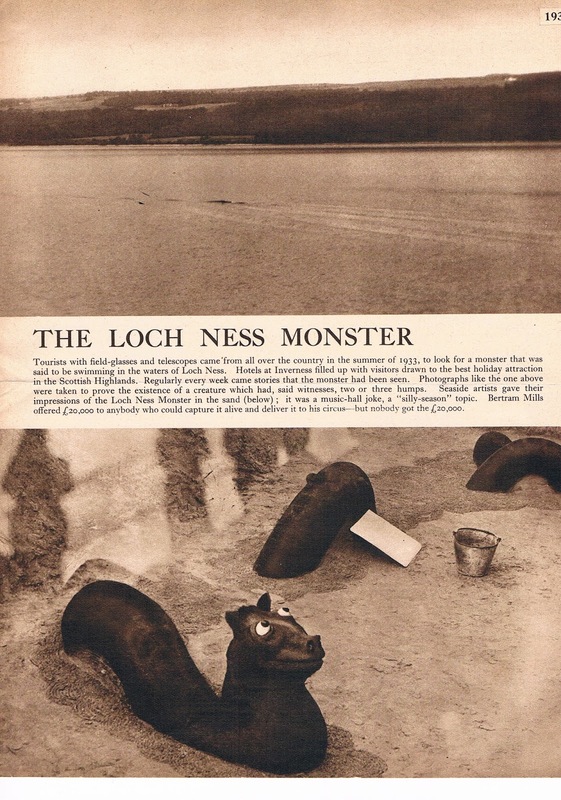 I had a look at Holiday's book, "The Great Orm of Loch Ness", to compare my preparations with his. Holiday drove up to Loch Ness for the first time in August 1962 - I was not even born yet. His was a spartan van, floored with a couple of army mattresses, tartan blanket, terylene sleeping bag, provisions, cooking gear, books, fishing rods, and, of course, camera and binoculars. His van was his hotel room and he parked wherever he thought appropriate on the same side of the loch as I find myself. One of the stops he describes sounds like the beach from where Lachlan Stuart had taken his three humped picture, eleven years before. Whether that was on his mind, I know not. After coffee, bacon and a bit of fly fishing, he decided to leave darkening Loch Ness to itself. Within days, he had his first sighting of the Loch Ness Monster at about 6am, not half a mile away from where I type. Dinsdale and Holiday had the good fortune to see the creature on their first visits. Some would claim this beginner's luck is too fortunate. I have had no such luck, though I am not inclined to survey the loch at such lonely times. Perhaps I would be better advantaged if I did. Snapping out of that fifty odd year flashback, there is now laptops and wi-fi to report current events to you. I will report further tomorrow. I recently bought this single page online as I thought it captured some of the mood of those crazy days back in 1933 when the world was suddenly swept along in the wake of a strange creature currently being sighted in a Scottish Highland loch that one suspects the majority had never heard of. By the time 1933 and 1934 had rolled on, they certainly knew about Loch Ness and its now legendary monster. I don't know the name of the periodical or when it was published, but its words are as follows. I would suggest that the top photograph is one taken by the Edward Mountain expedition of 1934 and is not of our favourite cryptid, but most likely a pattern of interacting boat wakes as betrayed by the sequence of fading waves panning to the left of the picture. Tourists with field-glasses and telescopes came from all over the country in the summer of 1933, to look for a monster that was said to be swimming in the waters of Loch Ness. Hotels at Inverness filled up with visitors drawn to the best holiday attraction in the Scottish Highlands. Regularly every week came stories that the monster had been seen. Photographs like the one above were taken to prove the existence of a creature which had, said witnesses, two or three humps. Seaside artists gave their impressions of the Loch Ness Monster in the sand (below); it was a music-hall joke, a "silly-season" topic. Bertram Mills offered £20,000 to anybody who could capture it alive and deliver it to his circus - but nobody got the £20,000.